Have you watched a movie from the 80’s or 90’s recently and thought “Man, those are some yellow teeth!” Over the past 10-15 years, it seems that teeth have become brighter, whiter and we’re always looking to make them brighter and whiter still. Many of our patients ask questions about teeth whitening, especially come summertime, so we thought we’d share some information with you in case you had the same questions. Moreover, we know you have weddings, family get-togethers and events this summer and if you’re not a fan of your teeth discoloration, we want to help. Throughout your life, it is common for teeth to look aged or discolored. This is due to the foods we eat and the way we take care of our teeth. Of course, drinks like coffee, tea, and red wine all play a factor in tooth staining. However, many people don’t realize that citric/acidic foods can erode the enamel exposing a yellowish tint. Oddly enough, many acidic foods are touted to be “natural” teeth whiteners such as lemon and strawberries. These do whiten the teeth at first, but end up wearing away enamel that will never return causing sensitivity and, you got it, yellowing! Other foods that can stain your teeth include dark berries like currents, blueberries, and blackberries. Basically, if it stains your clothes, it will stain your teeth. Brushing your teeth at least 2x a day is always a good practice and can help fight stains, but there are other options that penetrate deeper than surface stains. The bleaching gel ingredients include carbamide peroxide and hydrogen peroxide, which seep into the pores of the teeth to get at the base of the stain. These ingredients break down the stain and repeat applications expose the natural tooth color. Depending on the depth of the stain, more applications may be necessary to achieve the desired results. HOW DO I CHOOSE A WHITENING PRODUCT (THERE ARE SO MANY!)? We totally understand the confusion as there are tons of whitening products out there. There are lots of good options that you can buy easily BUT if you want the very best, we suggest KoR Whitening, which is available here at our office. KoR will give you the best, whitest smile guaranteed and we’re really excited about the results our patients have seen. 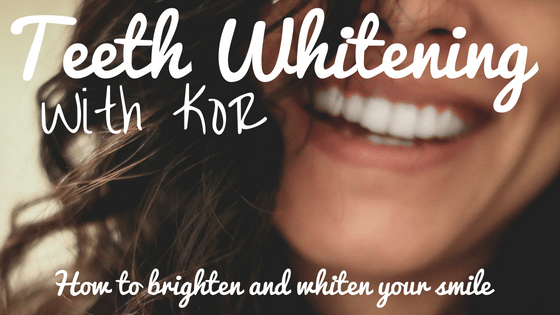 KoR whitening doesn’t just treat the surface stains, but the internal staining as well. It is one of the most advanced and researched products on the market. KoR sends us your custom trays and (cold) bleaching gels for your use at home. …BAM! Your teeth are beautifully whitened and you are good to go. Forever! THAT’S GREAT BUT WHAT DO ‘REAL’ PEOPLE SAY ABOUT IT? Whitening your teeth can really make a difference in your life, giving you the freedom to smile and never be ashamed of what you see! We believe in the process so much that the whole team here at MVDC are using the KoR system and would love to talk with you and answer any questions you might have! Feel free to give us a call at (509) 962-2755.